Between the salon and the master cabin is a small corridor containing cabinetry and also access to the head. The cabinets comprise three louvered doors with a long shelf on top. Behind the left two doors is the washer/dryer and behind the right one are 5 drawers. If you remove the top two drawers you will find two hidden shelves. 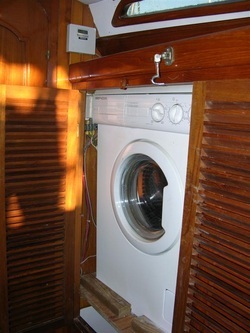 An air-conditioning unit is located below the washing machine and the drawers.